CARLETON: Is LSU Jumping Too Quickly To Conclusions Over Max Gruver's Death? CARLETON: Is LSU Jumping Too Quickly To Conclusions Over Max Gruver’s Death? Everyone wants to find out who is to blame for an 18 year old pledge’s death. When LSU Phi Delta Theta pledge Max Gruver lost his life last week through what appears to have been a case of severe alcohol poisoning, the entire community was outraged, and justifiably so. But the response to the tragedy ought to be measured and justified, and not hysterical. Was Gruver forced to drink? Was he held down and a funnel forced down his throat? We will find out soon enough based on the charges brought against the current members of the fraternity. Society considers them guilty until they prove their innocence. We shift the blame to universities and fraternities before we even know the facts. Maybe I’m a little harsh in believing this young man made a poor life decision and it took his life. At least in my opinion that’s more likely than the peer pressure being too much for him to endure. However, stereotypes exist for a reason and the expectation is that there must be some form of hazing for this 18 year old to die. We forget that at 18 years old you are considered an adult in every aspect except drinking. This young man could have decided to fight and die for his country. He could have gotten behind the wheel and spent the next several years of his life behind bars. He was old enough to decide what college to attend, what fraternity to pledge, and how much alcohol to consume. As a former frat boy I know all too well how easy it is to go overboard, especially in those few early weeks. Might as well get out the yard stick and figure out who has the longest one. We encourage young men to be confident and strong but when something bad happens today, it’s someone else’s fault. It’s LSU’s fault, it’s his pledge brothers’ fault, it’s the fraternity’s fault and they should be punished/sued. We quickly forget Ben Wynne was downing pitchers of Three Wisemen (Jagermeister, Crown Royal, and Bacardi 151) when he died of alcohol poisoning at Murphy’s Bar in 1997 at a Sigma Alpha Epsilon get-together. This would surely be the end of most of us, at the very least a quick pass to the ER for a stomach pumping. Mr. Wynne also had traces of GHB in his system which seems peculiar with the amount of alcohol he consumed. I’m no expert but Mr. Gruver also had THC in his system which might have hurt his chances in the sobriety game. Did someone hold him down for the bong hit? It’s a very sad situation, and we all wish neither of those deaths ever happened. Yet, here we are and we will continue to be. Young men make bad choices, it is a part of life. Sometimes we can’t come back from those mistakes. 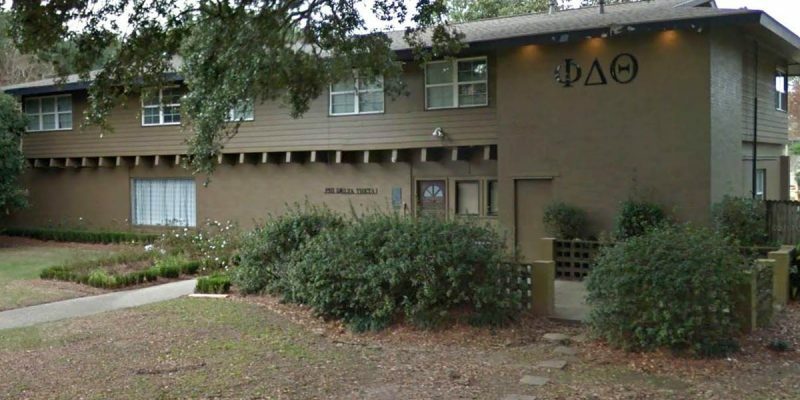 I’m not saying the fraternity shouldn’t be in trouble, there are some obvious rule violations and Monday the word came out that Phi Delta Theta has suspended the charter for its LSU chapter following the Gruver incident. However, why are we so quick to blame someone else when a young man decided to get involved in a dangerous drinking situation? Are people allowed to make bad decisions or are we always going to have to prove that someone else is innocent in every case? Is stereotyping some groups in our society ok and others is not? I’d like to think in any situation we should wait until the facts come out before the pitchforks – but not everyone gets that luxury. Let’s wait for the results of the investigation to be known, and let’s have the facts to establish guilt before we demand punishment.